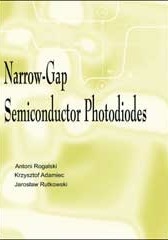 In this monograph, investigations of the performance of narrow-gap semiconductor photodiodes are presented, and recent progress in different IR photodiode technologies is discussed: HgCdTe photodiodes, InSb photodiodes, alternatives to HgCdTe III-V and II-VI ternary alloy photodiodes, lead chalcogenide photodiodes, and a new class of photodiodes based on two-dimensional solids. Investigations of the performance of photodiodes operated in different spectral regions are presented. The years during World War II saw the origins of modern infrared (IR) detector technology. The successful application of IR technology to remote sensing problems has been made possible by the development of high-performance IR detectors over the last five decades. Interest has centered mainly on the wavelengths of the two atmospheric windows 3-5 ?m and 8-14 (m, although in recent years there has been increasing interest in longer wavelengths stimulated by space applications. Many materials have been investigated in the IR field; among them, narrow-gap semiconductors are the most important. 2) The theory of narrow-gap semiconductor bandgap structure was not well known for correct interpretation of the measured transport and photoelectrical properties of these materials. The discovery of the transistor stimulated a considerable improvement in growth and material purification techniques. At the same time, rapid advances were being made in the newly discovered III-V compound semiconductor family. One such material was InSb. In 1957, Kane [J. Phys. Chem. Solids 1, 249 (1957)], using a method of quantum perturbation theory (the so-called k(p method) in conjunction with requirements from crystal symmetry to investigate the wave functions and from the energy bands at particular points in k space and particularly at k = 0, correctly described the band structure of InSb. Since that time, the Kane band model has been of considerable importance for narrow-gap semiconductor materials. The end of the 1950s saw the introduction of semiconductor alloys in III-V (InAsSb), IV-VI (PbSnTe, PbSnSe), and II-VI (HgZnTe, HgMnTe) material systems. These alloys allowed the bandgap of the semiconductor and hence the spectral response of the detector to be custom tailored for specific applications. In 1959, research by Lawson and co-workers [J. Phys. Chem. Solids 9, 325 (1959)] triggered development of variable-bandgap Hg1-xCdxTe (HgCdTe) alloys, providing an unprecedented degree of freedom on infrared detector design. The fundamental properties of narrow-gap semiconductors (high optical absorption coefficient, high electron mobility and low thermal generation rate), together with the capability for bandgap engineering, make these alloy systems almost ideal for a wide range of IR detectors. The material technology development was and continues to be primarily for military applications. A negative aspect of support of defense agencies has been the associated secrecy requirements, which inhibit meaningful collaborations among research teams on a national and especially an international level. In addition, the primary focus has been on focal plane array (FPA) demonstrations and much less on expanding the knowledge base. Nevertheless, significant progress has been made over three decades. At present, HgCdTe is the most widely used variable-gap semiconductor for IR photodetectors. Several reviews and monographs on narrow-gap semiconductors have previously been published. One of the well-known monographs is Narrow-Gap Semiconductors by R. Dornhaus, G. Nimtz, and B. Schlicht, Springer-Verlag, Berlin (1983). Also, many treatises and papers have been published in different scientific journals, such as Proceedings of Narrow Gap Semiconductor Conferences, Proceedings of US Workshops on Physics and Chemistry of Mercury Cadmium Telluride published in Journal of Vacuum Science and Technology and Journal of Electronic Material, and Proceedings of Conferences on II-VI Compounds published in Journal of Crystal Growth. However, these papers do not contain the basic physical principles of narrow-gap semiconductor photodiodes and their different characterizations dependent on the basic material used for detector fabrication. We hope that this book covers those issues. This book is written for those who desire a comprehensive analysis of the latest developments in narrow-gap semiconductor photodiode technology and a basic insight into the fundamental processes that are important to evolving photovoltaic detection techniques. Apart from traditional issues, new trends in the development of infrared photon detectors (new ternary alloy systems for infrared detectors, quantum well infrared photodiodes) are also included. Special effort is directed toward the physical limits of photodiode performance and the performance comparison of different types of detectors. The reader should gain a good understanding of the similarities and contrast, and the strengths and weaknesses of the multitude of approaches that have been developed over 40 years of effort to improve our ability to sense infrared radiation. The level of the book's presentation is suitable for graduate students in physics and engineering who have received a standard preparation in modern solid state physics and electronic circuits. This book will also be of interest to individuals working with aerospace sensors and systems, remote sensing, thermal imaging, military imaging, optical telecommunications, infrared spectroscopy, and lidar. To satisfy the needs of the first group, many chapters provide the underlying principles and some of the historical background of each topic before discussing the more recent information. For those currently working in the field, the book can be used as a collection of useful data, as a guide to the literature, and as an overview of the topics that covering the wide range of this subject. The book could be also used as a reference for participants in educational short courses organized, e.g., by SPIE. In this monograph, investigations of the performance of narrow-gap semiconductor photodiodes operated at short-wavelength IR (SWIR), 1-3 (m; medium-wavelength IR (MWIR), 3-5 (m; long-wavelength IR (LWIR), 8-14 ?m; and very LWIR (VLWIR), above 14 (m; spectral regions are presented. Recent progress in different IR photodiode technologies is discussed. This book is divided into 10 chapters. The introduction gives a historical overview of the development of IR detectors, detector classification, and describes a general theory of photon detectors. Chapter 2 describes the main topics in crystal technology of narrow-gap semiconductor materials as well their optical and electrical properties. Special emphasis is paid to the modern epitaxy technologies such as liquid-phase epitaxy, molecular beam epitaxy and metalorganic chemical vapor deposition. Because device performance depends critically on the photoexcitated carrier lifetime, Chapter 3 discusses the generation-recombination processes in narrow-gap semiconductor materials. Chapter 4 provides an overview of the general theory of three types of photovoltaic detectors based on p-n junctions, Schottky barriers, and MIS devices. An overview of FPA architectures is given in Chapter 5. The objective of the next four chapters is to present the status of photodiodes fabricated from different materials: III-V compounds (Chapter 6), HgCdTe (Chapter 7), alternative Hg-based ternary alloys (Chapter 8), and lead salts (Chapter 9). Chapter 10 focus on a new class of infrared detectors that utilize advanced growth techniques and "bandgap engineering" physics. Final remarks are included in the last chapter. The authors have benefited from the kind cooperation of many scientists who are actively working in narrow-gap semiconductor photodiodes. The preparation of this book was aided by many informative and stimulating discussions that the authors had with their colleagues at the Institute of Applied Physics, Military University of Technology in Warsaw, Poland. The authors thank the following individuals for providing preprints, unpublished information, and in some cases original figures, which could be used in preparation of the book: Drs. D. Amingual and J. L. Tissot (LETI-CEA Technologies Avanc�es, Grenoble, France), Drs. J. M. Arias and L. Kozlowski (Rockwell Science Centre, Thousand Oaks, U.S.), Dr. P. Becla (Massachusetts Institute of Technology, Lexington, U.S.), Dr. T. Elliott (Defence Research Agency, Malvern, UK), Prof. J. Piotrowski (Vigo System Ltd., Warsaw, Poland), Dr. M. Razeghi (Northwestern University, Evanston, U.S.), Dr. M. Reine (Lockheed Martin IR Imaging Systems, Lexington, U.S.), Dr. F. F. Sizov (Institute of Semiconductor Physics, Kiev, Ukraine), and Dr. H. Zogg (AFIF at Swiss Federal Institute of Technology, Zurich). Thanks also to SPIE Press, especially Susan Price and Sharon Streams, for their cooperation and care in publishing this edition.